As the summer months approach and the school year ends, the time for video games is now. Summer 2018 will bring loads of time to catch upon your favorite video games and explore new games! 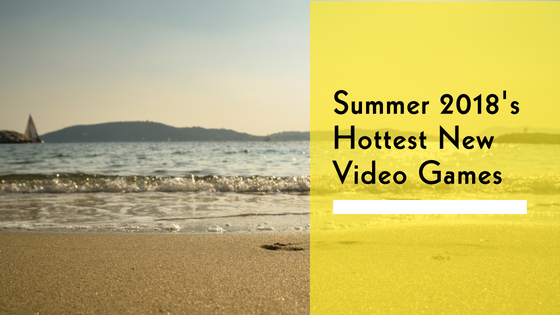 Here at GameTruck Jacksonville, we’ve compiled a list of Summer 2018’s hottest new video games to play with friends and family. Arguably the hottest game to be playing right now and into the summer is Fortnite Battle Royale. A free-to-play multiplayer online game, it has taken gaming culture by storm. Players can play alone or work in teams to work together to survive until the last player standing. Players can also take down and build elements as they see fit to help them along. No summer video gaming experience would be complete without it. Like Fortnite, PlayerUnknown’s Battlegrounds is also a massively popular online multiplayer battle royale game. While not the first battle royale game to be released, it quickly changed and impacted online multiplayer gaming. Players are dropped onto an island that slowly shrinks over time and must find weapons and armor with which to survive. Everything and anything is possible, and creativity goes a long way. With games able to support up to 100 players at a time, players can join up in groups and work together or play solo. While Dragonball Z has remained popular in the fighting game genre, Dragon Ball FighterZ takes the Dragonball franchise to a whole level never before seen. The game takes place at the time of the new show, Dragon Ball Super. There is a base of 24 playable characters with more to be released in the future. Teams of 3 characters are created for players to fight it out to win. All the strengths, moves, and special abilities popularized by the TV show are now in the hands of the player. Players can play in a solo campaign story mode or online multiplayer mode. After years of anticipation, Monster Hunter: World is the newest and best in the Monster Hunter series. The game is an open-world action role-playing game where players take on quests and missions to hunt down and capture or kill monsters that threaten the world. Players also build items, weapons, and armor from items looted from captured or killed monsters. This aspect can change entire outcomes and battles and affects gaming style, abilities, and combat moves. Sea of Thieves is a recent release from developer Rare, creators of the now legendary Goldeneye 007. Sea of Thieves is a pirate-themed action-adventure game where players will take on the roles of being a pirate on the high seas. The game is an open-world environment where players will take on missions to find treasures, fight other players, and explore the world. The game can be played in solo, co-operative multiplayer, or player-versus-player. More content and extras are planned to be released soon, which will alter levels and add new ones! Play these games and more this summer with us! Summer just isn’t summer without video games and friends! Plan your next Fortnite gaming party with us at GameTruck Jacksonville – with consoles including XBox One, PlayStation 4, Wii-U, and Nintendo Switch on HD Flat Panel TVs. Call us today at (866) 253-3191 or visit our website to plan and book your next video game party.